No-Go Glass Lock is a security device easily fitted to the glass panes of a double glazed unit that prevents unauthorised removal from the outside, but still allow removal of the glass unit when needed. Fully adjustable to fit any frame profile. Easy to install, a deterrent to intruders, an inexpensive solution giving you peace of mind. See our reconstruction case study video. Burglars know how to gain entry through externally beaded windows; they also know that the No-Go Glass Lock makes it almost impossible to gain entry without smashing the glass. 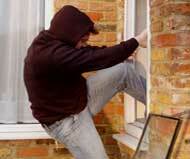 By fitting the NO-GO Glass Lock you are giving a strong visual deterrent to the burglar. The NO-GO Glass Lock is easy to fit in minutes and can be fitted by anyone with DIY skills or by one of our approved fitters. You can do this by simply looking at the windows. In externally beaded windows, the glass has been put in from the outside and is held in place by strips of plastic (the beads) which are clipped in place between the glass and the frame. Internally beaded windows are simply the opposite with beading on the inside. See our frequently asked questions page for some answers to commpnly asked questions. Any externally beaded window or glazed door which can be easily reached should be secured using NO-GO Glass Locks. Windows on upper floors can be vulnerable if they can be reached from a flat roof or from a wall. Not just opening windows are vulnerable – all externally beaded glass panels can be easily removed. The NO-GO Glass Lock is far cheaper than replacing your windows, having the glass removed and the glass “glued” back in or the cost of replacing stolen property. 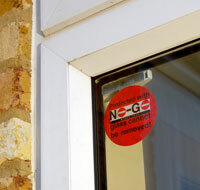 The NO-GO Glass Lock passed BS7950 and is approved to secure by design standard. The bonding agent used on NO-GO Glass Lock is so strong that a window would break before the bonding agent failed. The NO-GO Glass Lock is unique and the concept protected by patent. The NO-GO Glass Lock has been designed to provide a visual deterrent, but it has also been designed to match your frames and fittings. 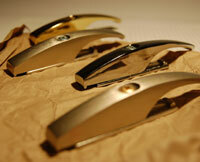 NO-GO Glass Locks are available in white, brown, gold, antique brass, chrome and brushed steel effect. The NO-GO Glass Lock is so secure that we will refund all your money spent with us if a window pane secured by NO-GO Glass Locks is removed by an intruder without the glass being smashed, provided it has been fitted in accordance with our instructions. If when you receive your No Go Glass Locks you decide not to fit them and return them in the original packaging we will refund you for the products. Using NO-GO Glass Locks or any other security measures could reduce your insurance premiums. Speak to your insurance company and ask them for details. 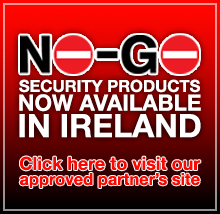 No-Go Security Products Ltd, St Andrew's House, 11 Dalton Court, Commercial Rd, Blackburn Interchange, Darwen, Lancashire, U.K, BB3 0DG.